Former President Bill Clinton and his daughter Chelsea went to a No Ceilings Conversation held at the Farasi Lane School in Mitini, Nairobi, Kenya on Friday, May 1st. The Farasi Lane School is part of a CGI Commitment to Action, CHARGE – Collaborative for Harnessing Ambition and Resources for Girls’ Education. CHARGE is a collaboration of more than 30 companies, civil society organizations, multilaterals and governments to improve learning and leadership opportunities for young women and girls. After touring the school with the principal and seeing a lesson by a teacher, the former president and his daughter visited the school’s garden with two students and heard about the different kinds of plants, herbs, and fruits that they grow. 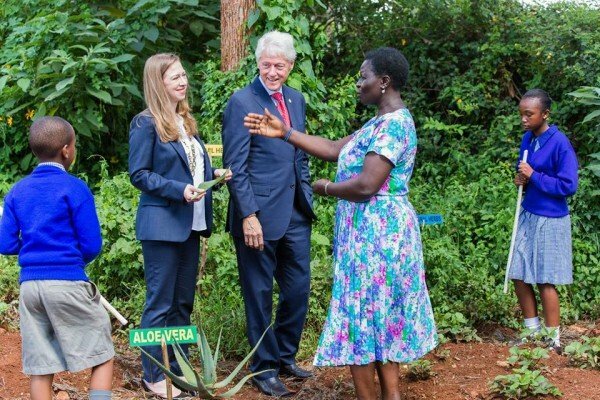 Earlier this week, Chelsea Clinton and her former president father landed in Tanzania, where they began their nine-day African tour, which will also take them to Liberia and Morocco after Kenya.